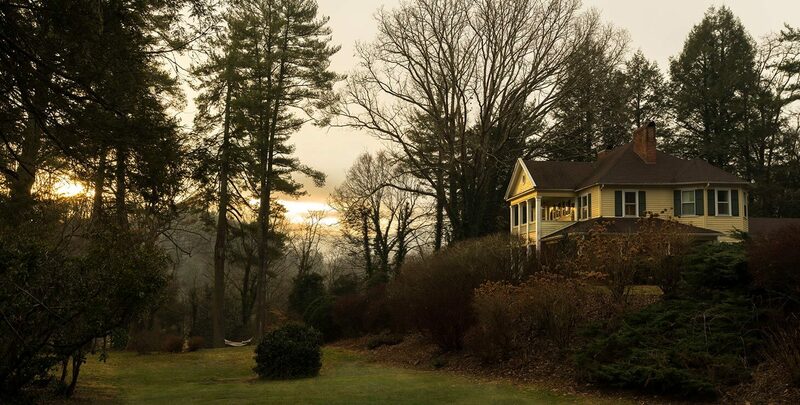 The Yellow House Bed and Breakfast offers the ultimate upstairs rooms in the stunning Western North Carolina Mountains. Located just east of Asheville in the scenic town of Waynesville, our five-acre property has plenty of open space for our guests to explore. Ideal for gatherings like family reunions, private parties, fun retreats, and elegant weddings. The perfect romantic getaway for couples. The Carolina Room receives ample sunlight with happy green and yellow colors that make this a bright and cheery room. 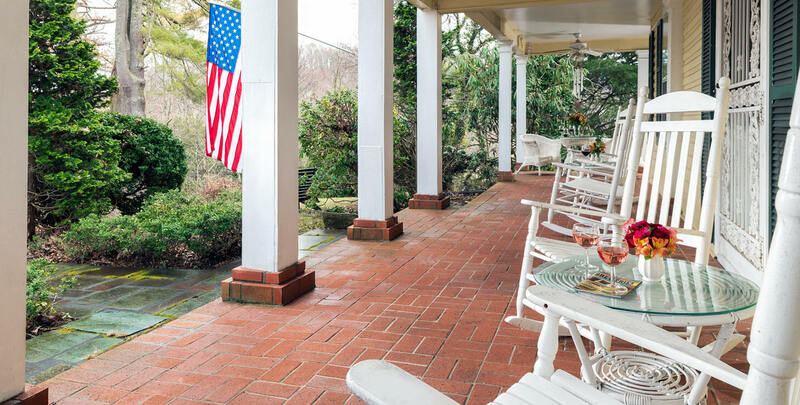 Offers the look and décor of Southern elegance in the Carolinas. Start your day by looking through the large bay window at the beautiful foliage and end your day by enjoying a good book on our quality queen-size bed by our cozy gas fireplace. On a quiet night, Plott Creek can be heard meandering from the mountain tops above to the valley below. 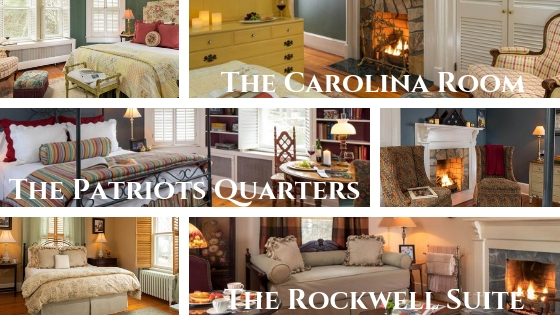 The Patriots Quarters is named in honor of those who serve our country (both in and beyond our borders). 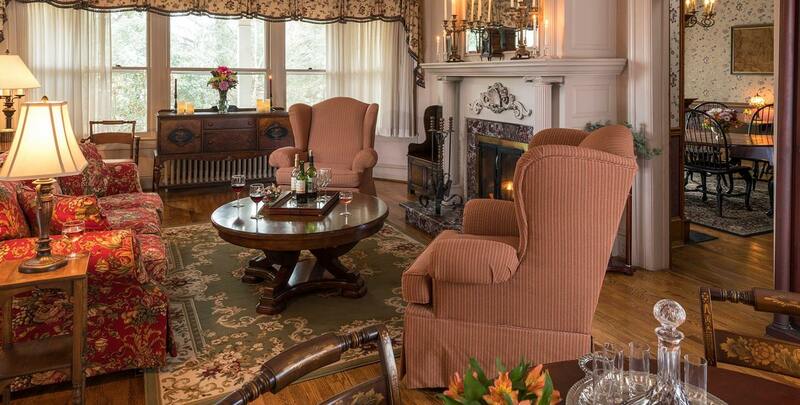 Features a queen-size bed, private library, sitting area, table and chairs, and a warm gas fireplace. This comfortable room with gorgeous mountain views provides an openness and at-home feeling that has been a real guest favorite! Our desire here at The Yellow House is for this room to remind us all of the sacrifices made daily by those who serve and protect us. Whether you are a veteran, or are currently serving, bring a military, police or firefighting ID and receive 20% off of our room charge as our way of thanking you! The Rockwell Suite has been named in remembrance of the great American artist, Norman Rockwell. This two-room suite with queen-size bed and separate day bed is decorated with Rockwell prints. Offers a Jack-and-Jill bathroom as well as a wet bar, two fireplaces and a private balcony that overlooks the gorgeous Blue Ridge mountains. Enjoy an afternoon out on the balcony, channeling your inner artist with the sketchbooks and pencils provided for you in the room. Come and relax in this luxurious two-room suite that accommodates up to three people. Splendid for a girls getaway to North Carolina! Each morning our guests receive their choice of a homemade healthful breakfast or a decadent gourmet breakfast. For a small fee, guests have the option of having their breakfast conveniently delivered to their room. The Yellow House Bed and Breakfast places our highest priority on the satisfaction of our guests. We appreciate all our guests and we look forward to hosting you, whether you are coming for the first time or as a returning guest.